Leesburg, Va. — When the Freedom and Tuscarora High School boys basketball teams met in early December, both teams were still trying to figure things out. Coming into that game, the Huskies were 0-4 and looking for their first win of the season, while the Eagles were 2-1 and looking to bounce back after a loss earlier in the week. Well, Tuscarora got what it was looking for as the Huskies’ shooters got hot, hitting eleven three-pointers while running away with a 24-point win. 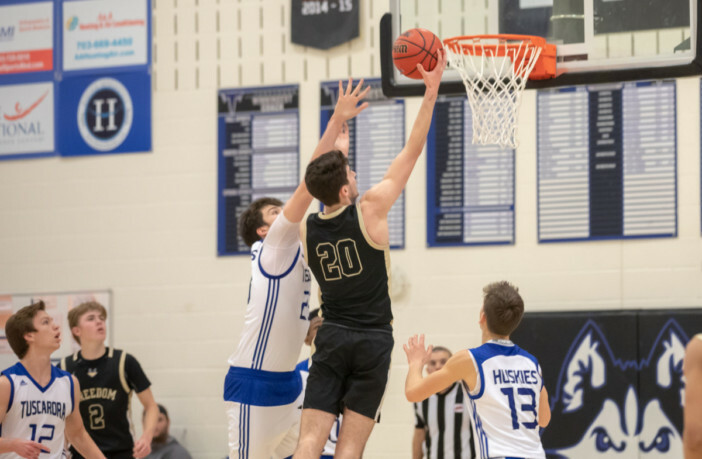 After scoring 21 points, including five three-pointers in the first game, Freedom held Tuscarora senior shooting guard Chandler Tuten to just 7 points and a single three in game two. The other big difference for Freedom was their ability to distribute the ball and score inside the paint. After scoring just 46 points the first time around, the Eagles got junior forward Lance Johnson and senior center Madden Moore much more involved in the offensive game plan the second time, as the big men combined for 22 points and 11 rebounds. Moore – who is coming off an offseason injury – scored a season-high 11 points off the bench. Moore led a Freedom bench that scored 31 points and added a much needed spark for the Eagles on both ends of the floor. Junior guard Zach Hoenig matched Moore with 11 points and went 4-for-4 from the line late in the game, and junior guard Angelo Easter added another 7 points off the bench. After starting on the wrong side of a 14-2 run to open the game, Tuscarora got some production off their bench as well. Late in the first quarter, Tuscarora sophomore guard Jack Clark connected on two threes and senior forward Artyst Marshall hit another to close the gap to 16-13 heading into the second quarter. Then midway through the third quarter, the Huskies completely erased the Eagles’ lead, tying things up at 38-38, thanks in part to the long range shooting of Tuten, Clark and junior guard Jadon White – who led all scorers with 21 points. The Eagles, however, quickly responded as Johnson added 9 of his team-leading 11 points in the third quarter to re-open the lead to 49-41 heading into the fourth. Then in the fourth, Freedom stepped up to the free throw line 22 times, knocking down 15 of them, to outlast Tuscarora, 68-63. After holding off the Huskies, Freedom (5-3, 10-5) is back in action on January 22 when the No. 3 Eagles travel to No. 2 Briar Woods (5-2, 9-5) as the teams vie for second place in the Potomac District. Meanwhile, No. 7 Tuscarora (2-6, 6-10) looks to bounce back against No. 5 Stone Bridge (3-5, 6-10) in Leesburg.